Opener A Canticle For The Pipe Organ (22:13) starts with an introduction with, indeed, pipe organ (church organ) – and despite my passion for churches (unless they’re burning…), I’ve always adored the full, bombastic sound created by this tiny little instrument. No, seriously, no matter whether you like the melody; the sound of that organ is just so fabulous (personal opinion; you do not need to agree). After about two minutes, church bells take over the lead, and close to three minutes, finally the first guitars join in. the track evolves towards the core business of Quercus: performing desolate, melancholic and grieving Doom-Death. Quercus fundamentally bring about everything that characterises the essence of the scene: very deep, almost gurgling grunts, a massive rhythm section (quite fine bass melodies and slowly pounding yet prominent drum patterns), emotional (twin) leads, and heavy guitar support with fine melodious structures. In performance, the better part is not renewing, yet rather paying tribute to the origins of the scene. But quite important in this band’s case is the use of many keyboard layers (with that aforementioned church organ alike sound), both as background support as well as lead melody. They are not used as means to turn the whole into some cheap gothic-alike pulp [(*)]; on the contrary, I think that those synths strengthen the negativity of the whole experience. 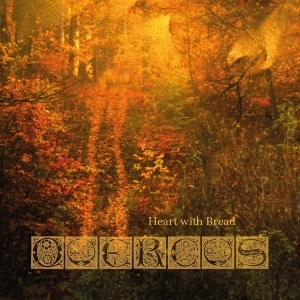 Besides, Heart With Bread finds quite of its inspiration with the Funeral Doom scene, and just like acts such as Thergothon, Evoken, My Shameful or Monolithe, Quercus succeed to find the perfect mixture in between the funereal aspects of the Doom scene, and the old styled tradition of the ‘classic’ Doom-Death current. Another distinctive element is the injection of quite ‘different’ excerpts, such as a couple of neo-progressive and avant-garde chapters (limited yet quite typifying; remarkable yet not exaggerated), or the plenty semi-divine symphonic orchestrations. And what about the sound quality? Well, this one actually fits perfect to the stylistic approach, for being quite professional in mix (you can clearly distinct every instrument used, and none of them overpowers the others), and balancing in between unpolished and clean (translation: little rough-edged yet not noisy at the one hand, and decently produced, yet luckily not with a clinically sterile modern result at the other hand). This strengthens the organic approach this band is surely (clearly) aiming for. A final word about the last piece, My Heart’s In The Highlands. This one is based on a sacral and integer symphony by Estonian esoteric / classical composer Arvo Pärt (who developed the so-called tintinnabuli-style). The lyrics are based on a poem by Scotland-born Robert Burns (16th century), by the way. It’s quite remarkable to notice that Quercus succeed to maintain the integrity and divinity of the original classical piece, yet translated through their self-developed funereal craftsmanship. This cover fits impeccably to the essence of Quercus’ Doom Epic!